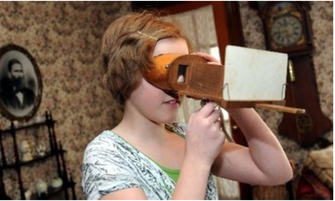 Jacquelyn Buckner, 12, looks through a steroptician at the Dekker Huis Museum in Zeeland. Cory Olsen / The Grand Rapids Press. ZEELAND — Sisters Jacquelyn and Kailey Buckner took turns weighing things on an old-fashioned scale in a portion of the Dekker Huis Museum that depicts the former Huizenga’s Grocery store as it might have looked 75 years ago. Then the girls, ages 12 and 13, went next door into the room featuring the former Zeeland State Bank, where they wrote out “checks” and stamped them with a bank seal. “This is awesome,” Jacquelyn said over and over to her sister and her mother, Joan. 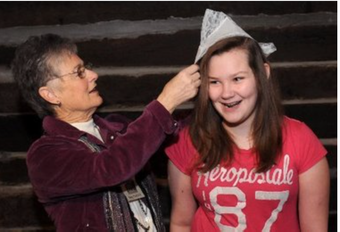 Docent Suzy Frederick adjusts a Dutch hat for Kailey Buckner, 13. The two rooms are part of a new hands-on exhibit at the museum, which is operated by the Zeeland Historical Society. 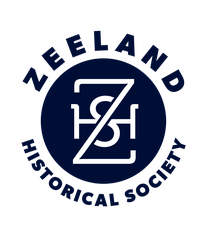 The effort to encourage visitors to learn more about Zeeland’s history through interactive activities is a highlight of the museum’s — and the historical society’s — 35th anniversary. Dekker Huis was originally home to the Dekker family, one of Zeeland’s most prominent. Built in 1876 by Dirk Dekker, it originally served as not only the family home but also a grocery store. Dekker’s son, Henry, later operated a jewelry store in the same building with his wife, Agnes. Their son, Randall, a former city attorney, was instrumental in working with the historical society to convert the home into the museum, which opened for public tours in April 1976. A $250,000 addition and renovation in 1999 included the creation of the Huizenga Grocery and Zeeland State Bank rooms and updates to the Pioneer Room, which depicts the founding of the Zeeland community by Dutch settlers, led by Jannes Vander Luyster, in 1847. “This was a very important community in the settlement of the western part of Michigan (along with nearby Holland),” Voss said. In addition to maintaining a two-day-a-week schedule for the museum, the historical society has also been active in restoring the New Groningen Schoolhouse on Paw Paw Drive. That renovation project is expected to be completed this year, allowing the society to move its schoolroom display out of Dekker Huis and into New Groningen. The Dekker Huis Museum, 37 E. Main St. in Zeeland, opened for public tours in April 1976. An anniversary open house, with cake and coffee, will take place 10 a.m. to 5 p.m. April 14 and 15. A “Teddy Bear Tea” will be held April 16 at the museum as part of the city’s Day of the Young Child festival.